Hey everyone! 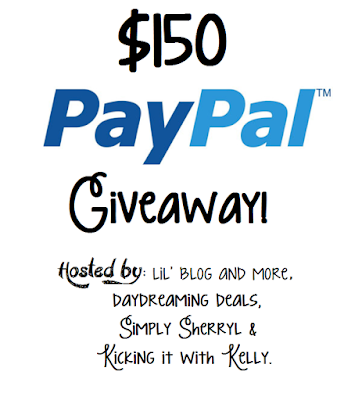 Thanks for stopping by for my latest giveaway event! This is a fun event, with tons of great bloggers involved. Disclosure: The bloggers involved in this giveaway were not compensated, and are not responsible for prize fulfillment. Lil' Blog and More will be sending the prize out. Must be 18 years of age or older to enter this giveaway. This giveaway starts March 20th, 2016, and will end on April 7th, 2016 at 11:59 pm. The winner will be emailed, and have 48 hours to respond, or a new winner will be chosen. Once a winner is drawn and confirmed, the name will be announced on the GiveawayTools form. I'd use this money for my teen's high school graduation party (SOB). Hard to believe my baby is going to college next fall!!!! I love food, so I think I'll spend the cash for a day of food hunting with my friends and then treat my family out to a nice dinner. I'm sure it would get spent on nail polish, makeup, or jewellery. Or a little bit of all. :o) Thanks for the giveaway! It would definitely help pay for my eldests sons surgeries that are coming up this next month as I could transfer it to my bank account. THANK YOU!! If I win the contest will buy shoes. Thank you!! I would use the extra money to secretly get my husband a gift that pertains to his hobby,dirt bike riding,even though I worry when he does it,I know it makes his so happy. I'd use it to purchase some adult coloring books and gel pens. Thanks. I'd put it towards a lot of little things I've been wanting like books, pet goodies, video game stuff, supplements, etc. Awesome giveaway!